A dubious world record: the Philippines is 51st on Foreign Policy’s Failed States Index, slightly better off than Bolivia and the West Bank (sort of not a state, I guess). Democratic elections will see power transfer from President Gloria Macapagal-Arroyo to her successor, Benigno S. Aquino III, at the end of June. Despite booming foreign investment, poverty is the dominant reality for the country’s population. 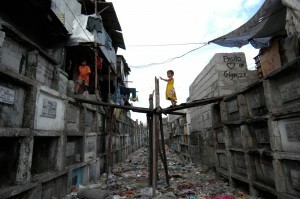 Here, a child walks between shantytown blocks built on tombs. As deputy presidential spokesman Gary Olivar says, it’s the numbers that count.